The following EPUB files can be downloaded and read on any digital reader, such as Adobe Digital Editions or Kindle for PC. The forms below were created by Media Trends to assist in organizing and planning your newspaper pages. Click to download any or all of them. If you have any questions about how to best utilize these forms, give us a call at 732-548-7088. 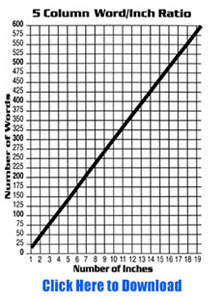 Use this guide to help determine how much space an article will take up on the page. 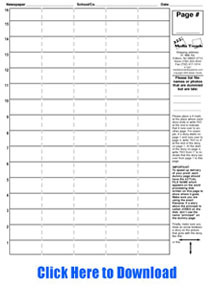 This form represents your tabloid page. Use it to make a "rough draft" to see how your articles and photos fit on the page. Whether Media Trends produces your layout or you do it yourself, this form will help you to organize your articles and photos on the page and makes page layout a much more comfortable part of the newspaper production process. 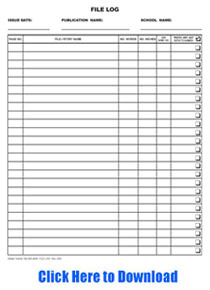 This handy form helps to organize your files and keeps track of what items are assigned to each page.